This is the 10th incarnation of one of the most successful and innovative soccer boots ever created, adidas' Predator X. It's a boot created for the leaders on the field, powerful players like Karim Benzema, Steven Gerrard, Robin Van Persie and David Beckham. The world’s top boot is back with the perfect combination of stylish looks and elite performance. Every single element is designed to improve performance. 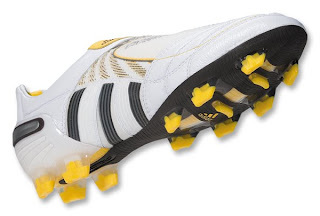 adidas Predator X TRX FG Cleats (white/dark brown/pure yellow). 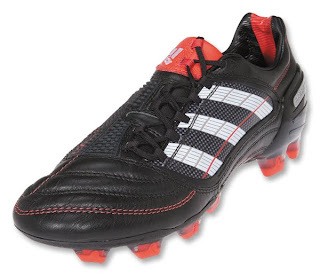 adidas Predator X TRX FG Cleats (black/white/red). Newly developed Tuarus full-grain calf leather upper for a supreme touch, excellent fit and a natural look. An opti-fit upper construction creates the ultimate fit bringing the boot as close to the foot as possible for maximum movement control and maximum ball control. Re-engineered Predator is more abrasive for constant swerve, control and accuracy in any weather condition. Asymmetrical loop lacing for a larger, cleaner kicking surface. Dual compound Xternal heel counter is smaller but extremely strong and reduces pressure on the Achilles tendon. Anatomically molded EVA insole for comfort. Traxion FG sole for grip and comfort on firm, natural surfaces. Newly developed internal chassis construction contains a revolutionary Powerspine that minimizes energy loss and maximizes power. The Powerspine redirects power directly into the ball while offering important metatarsal protection.